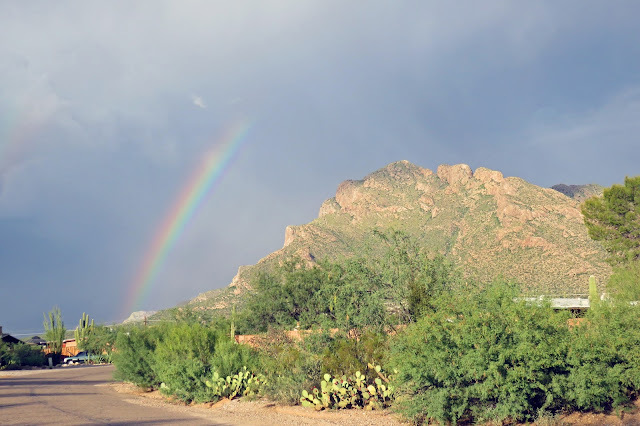 A storm heading to our side of town brought a rainbow to grace our mountain. It's actually a double rainbow - you can see the very faint arch of the second one on the left side of the photo. Interesting rainbow fact: In a primary rainbow, the arc shows red on the outer part and violet on the inner side. This rainbow is caused by light being refracted when entering a droplet of water, then reflected inside on the back of the droplet and refracted again when leaving it.